A while back I noted the disquieting resemblance between the Emperor Gorg (of Fraggle Rock) and L. Ron Hubbard (present whereabouts unknown). Now my sources have alerted me to this clip from the short-lived Muppets Tonight. 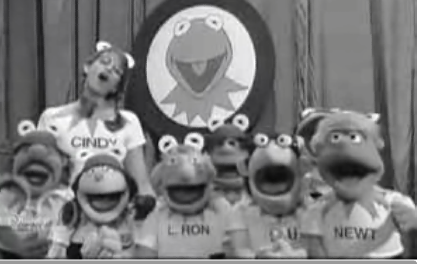 The premise of the clip is a look back at “The Kermit Frog Club,” like the Mickey Mouse Club but with Kermit as the object of devotion and guest Cindy Crawford in the Annette Funicello role. (The MMC is outside the range of my pop culture: I have no idea what I’m talking about here.) Anyway, of interest are the muppet Frogsketeers, whose names are emblazoned on their shirts: along with Cindy, there’s Newt, Stu, and … L. Ron. Now that I look at the screenshot again, Newt’s crop of hair is also somewhat evocative. …Based on several products of the system that I know, if I’d have had the chance to pursue an elite French education, believe me I’d have taken it. Actually, this response went a great way toward redeeming the post itself, as far as I was concerned, and though the response surely couldn’t have been entirely unanticipated. So, anyway, thanks. And sorry, don’t mean to hijack the muppet thread. The real history of L. Ron is as odd a slice of California noir there is to be found. L. Ron seems to been involved in all sorts of strange doings, as indicated by his friendship and then estrangement with Jack Parsons, rocket scientist, Cal Tech founder, and pen pal of none other than Aleister Crowley. (Parsons accidently detonated himself doing some rocket tests in his Pasadena home; others say Parson’s death was not accidental at all). L. Ron’s demise on a Central CA ranch is itself shrouded in mystery. There are autopsy reports showing narcotics in his body at the time of death–strange, since HUbbard and Scientology doctrine adamamtly prohibited the use of drugs. There are many theories–including the possibility he was murdered. Um Jake, I think you meant to say Jack Parsons, Jet Propulsion Laboratory co-founder, not Cal-Tech. one of the muppet babies writers was a scientologist. Thanks to the time lags in going from the US to Australia, MMC was brand new when I first watched TV. All I can remember, though, is the song and Annette. Jesus–I always knew that story about Jim Henson dying of pneumonia was a fake. They killed him!! And Kermit!! And Ernie too!! (And there I had always thought he was killed by Bert, teaming up with Osama). Actually–I gotta say–Henson was very cool, and I was very bummed at his death. Aw yeah Henson was a master. Imagine, tho, if he took his muppet-realism a bit farther: a NC-17 re-enactment of Jack Parsons’ last few days, with like Kermit as the troubled rocket scientist-black magician and Ms. Piggy as his hotsexxay Scarlet Woman…yass…then various other muppets playing L. Ron, Uncle Al, etc. But why stop there? The Muppets, in Moscow 1917 (Into zee mineshaft your filthy bourgeois jackals! ); or the Beer Hall Putsch–perhaps flying ol Enola Gay, or like Westmoreland and the boys Saigon ’68. That’s entertainment and history. The comments on Zizek and Badiou were some of the best I’ve seen on CT in a while. I don’t approve of its closing, especially before I had a chance to post. Yeah right you’re being all “free Zizek!” so we’ll all be like “Oh Zizek and fries twice, for sure” and you’ll be like “That’ll be 28$” and we’ll be like “What?” and you’ll go “Fries ain’t cheap, and there’s a service charge”. We know your sort, “bro”. “Free Zizek!” lapel buttons are now available at the monastery gift shop. The brothers voted not to include “Free Badiou!” lapel buttons at this time. I might add that we do have a collector’s item, a slightly scratched “Free Huey!” button. Free Huey, Dewey and Louie. Jake, if you haven’t already seen Meet the Feebles, you absolutely must seek it out.